At CES 2018, Sennheiser has just unveiled something for those who don't want to deal with headphone cables: its new CX 6.0BT Bluetooth wireless earbuds are light-weight, feature a solid, 6-hour battery life and cost just $100 (€99 in Europe). The new Sennheiser CX 6.0BT weigh merely half an ounce (14 grams) and will be a rival to other wireless headphones like Apple's AirPods, Samsung's Gear IconX and Bragi's Headphones. Unlike the popular AirPods, these new Sennheisers have two earbuds that are actually connected by an around-the-neck wire in a manner similar to Google's Pixel Buds. You have a controller with a microphone and the earbuds also feature voice notifications about the battery status. You can connect and pair two devices simultaneously to these earbuds. Sennheiser says that the CX 6.0BT feature "clear, detailed sound with an enhanced bass response". 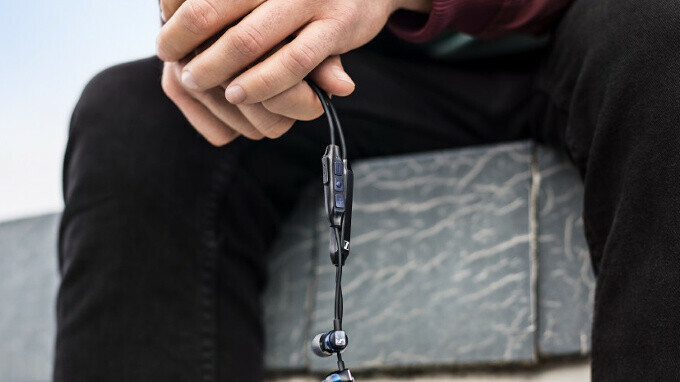 The buds have Bluetooth 4.2 connectivity and AptX support for higher-quality, low-latency streaming. There are four different tip sizes to ensure proper fit for different ears. We typically find three ear tip sizes on most affordable headphones, but having four ensures more precise fit. Last but not least, you have quick charge support. You can give the earbuds a quick, 10-minute charge to regain 2 hours worth of playback time, while for a full charge you will need one and half hours. The Sennheiser CX 6.0BT are now officially shown at CES 2018 and they will go on sale later on in January. I hope Bluetooth 5.0 will overcome the poor quality of wireless earphones & wearables in general & will finally come to one of them soon even if 5.0 was already available back in March 2017 with the s8. Wearable tech is so outdated! Aptx hd closes the gap quite a bit. Enough that BT is fine for me now. Right.. Qualcomm's APTX and Sony's LDAC is a way to increase audio quality.. There's a reason that Companies don't use Bluetooth 5 in headphones . There's not much difference between 4.2 and 5 in terms of power consumption and latency maybe that's the reason.